Quickoffice Pro HD for the iPad is a great solution for those looking to create and edit documents, spreadsheets, and presentations on the go. It boasts the luxury of having three apps in one, and supports a variety of popular cloud-based storage sites, including Google Docs and Dropbox. While there are some drawbacks, Quickoffice, Inc. has given iPad users a solid all-around offering at a fraction of the price of its competitors. If you’re familiar with Apple’s own iWork suite of apps (Pages, Keynote and Numbers), then you know how great it can feel to edit and create documents and presentations on an iPad. The ease of dragging and resizing pictures, creating graphs and charts, and scrolling between pages feels so right. 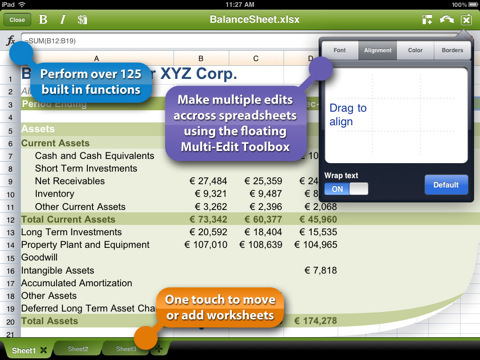 Quickoffice Pro HD captures that same ease without sacrificing any extra features. You may also be familiar with the frustrating inability to pull in creations from Google Docs, and let’s face it, Google Docs just doesn’t really work in Safari. Or you might want to export your documents using Dropbox, Box.net, Slideshare, or Scribd, all of which Apple’s iWork suite lacks support for. Thankfully, Quickoffice Pro HD combines the ease of working with office documents on the iPad, without sacrificing compatibility with other document sources. Quickoffice Pro HD does lack in a few areas, most notably it is without a word and character count. Also, any extensive formatting, especially in the word processor and spreadsheet, would be best left to a desktop or laptop device after exporting. With that being said, Quickoffice Pro is more than capable of handling basic formatting, and should have more than enough tools for you to create any presentation you might need. Quickoffice Pro HD also supports an autosave feature that, while convenient, will display a distracting status bar in the middle of the screen for a fraction of a second while it saves. I would have preferred to have this saving done in the background, or at least near the top of the screen, where it isn’t mistaken for a push notification. Quickoffice Pro HD also supports the use of external Bluetooth and docked keyboards, complete with support for arrow and function keys, which is close to essential for any lengthy document creation. In addition, Quickoffice Pro HD supports AirPrint for wireless printing, as well as saving documents in PDF form, and the ability to display presentations on an external display with Apple’s Digital AV Adapter. Quickoffice Pro HD for iPad is normally available on the App Store for $19.99, but is currently on sale for $14.99. This app is a great alternative for those looking to create and edit office documents on the go, but want to avoid spending the combined $30 for Apple’s iWork suite. AppSafari review of Quickoffice Pro HD was written by Alex Seiver on June 22nd, 2011 and categorized under App Store, Files, iPad apps, Productivity, Reading. Page viewed 7437 times, 1 so far today. Need help on using these apps? Please read the Help Page. I recommend you only use for very simple work. 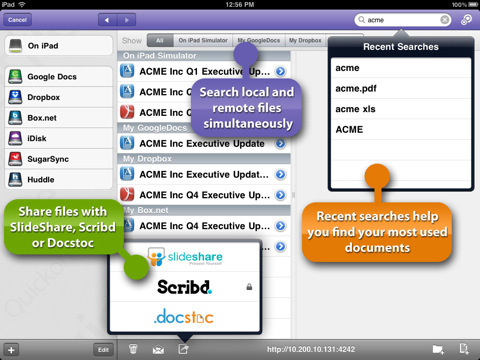 Other apps such as CloudOn and Documents Unlimited appear more awkward to use but have fewer bugs..